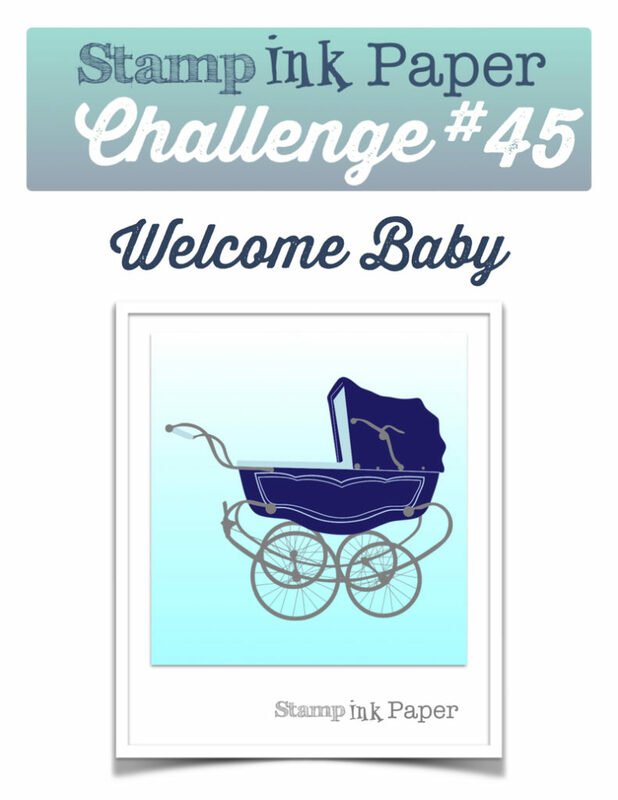 SIP Challenge 45 – Welcome Baby! Home / 2015-2016 Annual Catalog / SIP Challenge 45 – Welcome Baby! Another interesting day for me in Manhattan! I took the same train that I always do but decided to mix things up a bit and take the Subway from Jamaica Station. Thankfully I got a seat because there were some delays and it took just over an hour. There was also some guy on the train that was singing and dancing around for no good reason. It’s a little crowded in the mornings on the Subway to share your “talents” or lack there of! LOL! I was by myself until 2:00 when Mary came in. A Stampin’ Up! Demo from Wisconsin by the name of Melynn Long stopped by and we had a very nice visit! I made the 7:11 train and stopped by my parents for a bologna sandwich before coming home and wondering on my projects for the evening. Today I’ll be back at The Ink Pad with Barbara and the second Hand-lettering Class so I’ll be at the store until at least 9:30. I enjoyed sitting in on the class last time so I’m sure that it will be fun again! This entry was posted in 2015-2016 Annual Catalog, Blog, Cards, Copic, Crafts, Embellishments, Simon Says Stamp, Stamps, Unity and tagged Card Making, Crafts, Simon Says Stamp, SIP Challenge, Stampin' Up!. Bookmark the permalink. So cute–and I love the way the swoop mimics a baby bump. Enjoy your day in Manhattan. City commuting is always an adventure, isn’t it? FABULOUS Card!!! Love the Glossy Accents on the jar!! Love this card Justin! The curved edge is so innovative! The color combo is sweet and the Glossy Accents really do enhance the jar to make it look like glass. I’ve tried using the Glossy Accents for this look but have had a problem with the card stock becoming misshapen. I think perhaps I put it on too thick or something. You have just the right touch and your artistry is amazing. Thank you Grace! Someone mentioned that the curved edge looked like a belly! Sometime when I use Glossy Accents it makes the paper curl too. But if I do it before I cut it out I can bend the paper back before it dries! I actually did have pickles and ice cream together once in my first pregnancy, and it wasn’t bad! I love the quirkiness of this card, brought back this forgotten memory! This is such a cute card, Justin. I love the pickle jar for this theme. 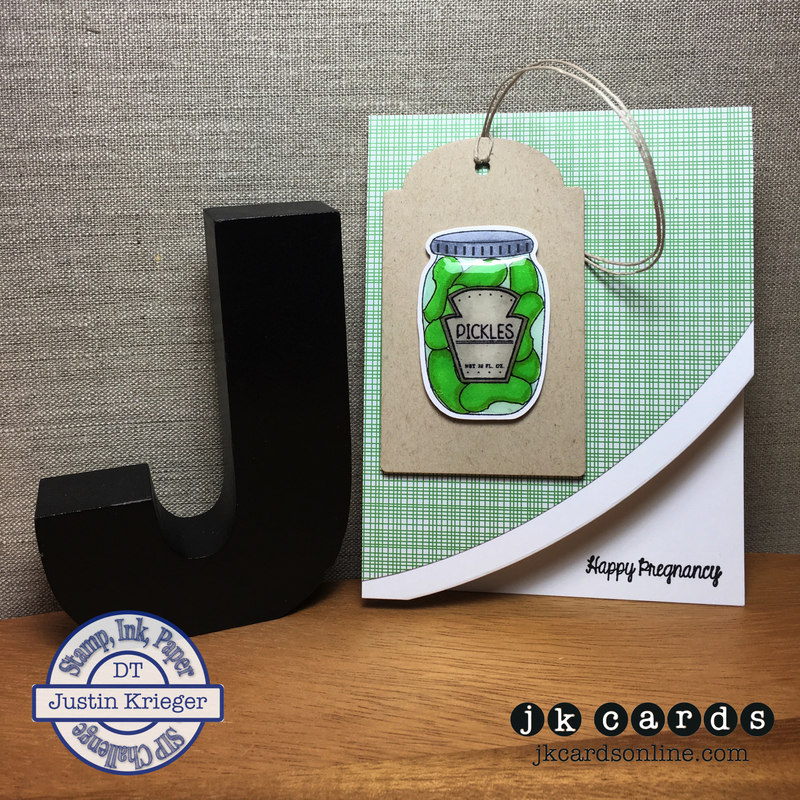 My husband is a pickle lover and that stamp set would be perfect for his birthday card. Glossy Accents was perfect to make the jar seem like glass. One day you’ll have to show us some tips you are learning in the hand-lettering class. My handwriting gets worse as I get older. Have a great day in the city. Great card–love the Glossy Accents! And love your subway story too–haha!